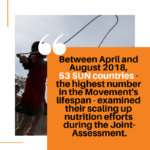 Every year, all 60 member countries of the Scaling Up Nutrition (SUN) Movement are invited to undertake a Joint-Assessment – an essential moment for in-country partners to come together and reflect on their contributions towards scaling up nutrition. As a participatory exercise, the Joint-Assessment offers a space for each stakeholder group (such as the government, the United Nations, donors, civil society and the private sector) to present their own contributions towards improved nutrition coordination and progress seen towards reaching the Movement’s strategic objectives – from where they stand. In 2018, a record 53 out of 60 countries undertook their Joint-Assessment, with organising face-to-face meetings to complete or share results from their exercise. With 95 per cent of SUN countries having undertaken this important exercise at least once since 2015, a resounding feeling, across the board, is the appreciation of having the chance to, in an open and transparent manner, share progress and bottlenecks among different stakeholders. “The participatory approach allows for the sharing of best practices and innovative ideas, to accelerate the joint efforts to scale up nutrition,” Namibia reports. In addition to being key to celebrate progress, the Joint-Assessment is also an opportunity to align visions and priorities for the period to come. For Liberia, for instance, “coming to a consensus in a constructive way is very helpful. This is an opportunity for all to get to the same level of information,” argues Côte d’Ivoire. With the knowledge that fighting all forms of malnutrition requires more people, and the right people, to gather around the nutrition decision-making table, many countries have harnessed the momentum of this Assessment to stimulate greater engagement of key stakeholders and bring onboard new partners. Ghana, for instance, states that “members participating in the exercise for the first time were able to provide information on progress made over the last year and contribute towards setting priorities for the upcoming year”. 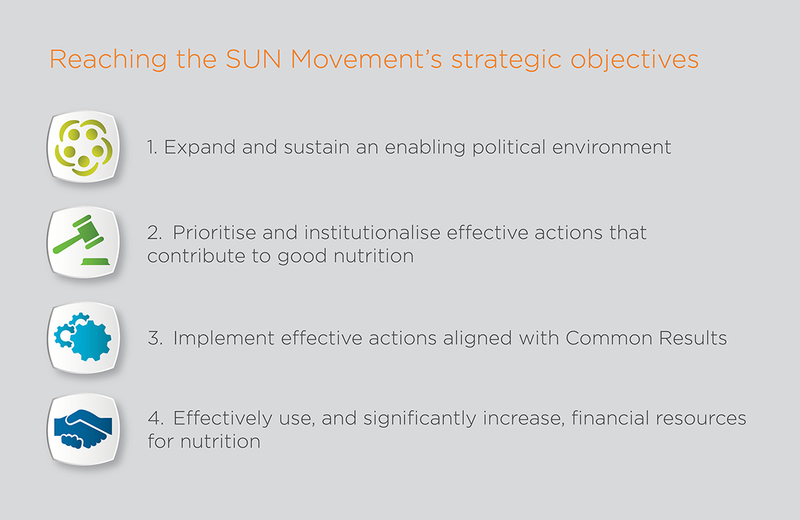 This Assessment – a truly unique feature of the SUN Movement – offers an important moment to celebrate the multi-stakeholder and multi-sectoral approach that is at the heart of the Movement’s strategy and enables the institutional transformations needed for lasting impact on women, men and their families. Philippines expresses that “everyone was inspired to see that many people coming onboard [during their Joint-Assessment]. This is evidence of sectors really moving together”. Looking ahead, the 2019 Joint-Assessment will endeavour to strengthen the celebratory spirit of the Assessment by simplifying the reporting process, which will take the form of an online reporting tool. With this little change, more time for reflection, sharing of information and learning from each other will be made possible.